The present work is concerned with some important issues of Imaginative literature and has made their critical and comparative study from Indian and European points of view. 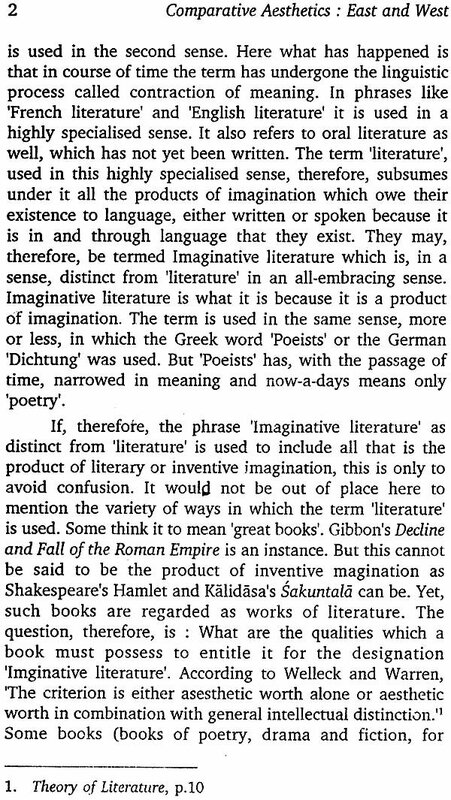 The issues are (i) nature of Imaginative literature, (2) Art as mimesis, (3) Rasa and Beauty, (4) the purposes and functions of Kavya (5) the language of literature and (6) drama as a Literature genre. It has been shown here that the soul of imaginative literature is Rasa. In the chapter on 'Art as mimesis' several meanings of imitation from 'bare copying' to 'creative activity' have been brought out. In a separate chapter the book exhaustively deals with the three powers of word viz., Abhidha, Laksana and Vyalijana which have been enalysed and compared with the European view of Language and its different powers. The problem of communication between the writer and the readers and the role of language in this context have been throughly discussed. A detailed study of style has also been made here. 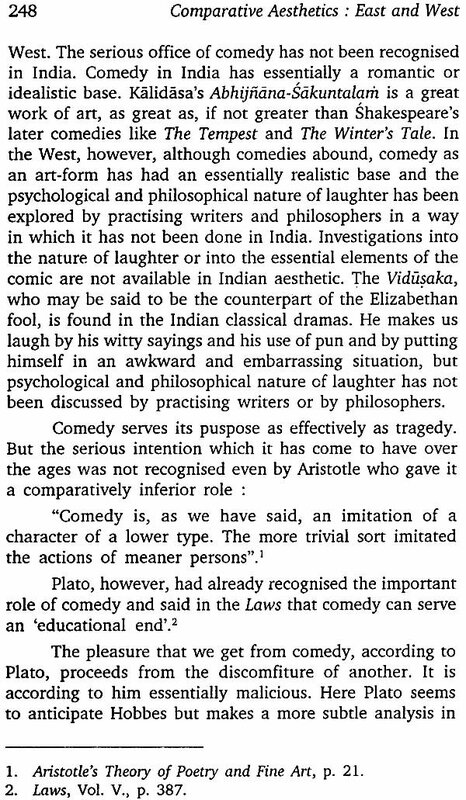 While making a study of drama it has been shown why tragedy grew in the West and why it did not find congenial soul in India. The book is a definite contribution to the study of Comparative Aesthetics inasmuch as it brings out the points of agreement and difference between the .Aestheticians of India and those of Europe. For those who are interested in a general theory of Aesthetics on either side of the world, this book with its exhaustive at the end will to serve their purpose. The author Professor Angaraj Chaudhary taught English and Pali literature for about thirty years at Nava Nalanda Mahavihara, Nalanda, Bihar. There he carried on research work on Comparative aesthetics and also edited some of the Pali Atthakathas for the first time in Devanagari script. Soon after retirement from Bihar Education Service, Govt. of Bihar in 1992 he joined Vipassana Research Institute, Dhammagiri, Igatpuri, Nashik, Maharashtra established by Vipassandcarya Shri Satyanarain Goenka. Here he has been editing Pali books and translating some of the Pali Atthakathas (written 1500 year ago but not translated into any other language so far) into Hindi for the first time. He was one of the editors who edited the Pali Tipitaka with its atthakathas, tikas and anutikas in Devanagari script in 140 vols for the first time-a Himalayan task never undertaken anywhere in the whole world. His First published book is Comparative Aesthetics: East and West. His second published book is Essays on Buddhism and Pali Literature, which contains twenty-seven essays on different aspects of Buddhist Philosophy and Pali literature. Currently he is engaged in completing the book on Buddhist Aesthetics, which attempts to bring out the salient features of the 'beautiful' according to the Buddha. Comparative Aesthetics, as a discipline, is of recent growth. It does not have a long tradition like the disciplines. Comparative Philosophy, Comparative Philology and Comparative Religion. At a very liberal estimate we can date it back to the works of two western orientalises, namely, Sylvan Levi and A.B. Keith. The Indian Theatre by Levi, came out in the year 1890 and The History of Sanskrit Literature by A.B. Keith appeared in the year 1920, The 'Sanskrit Drama; by the latter appeared in 192, 4. These actions were deeply and widely read in Sanskrit literature. They were sensitive students of European literature too. 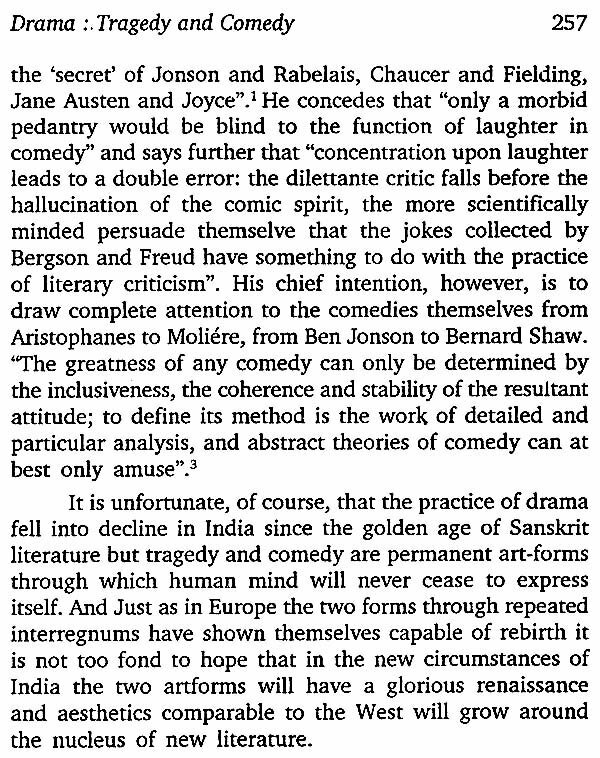 Their critical sensibility, fed upon European literature, could. Not but try to evaluate the achievements of Sanskrit Literature by the standards of judgment derived from a different tradition. 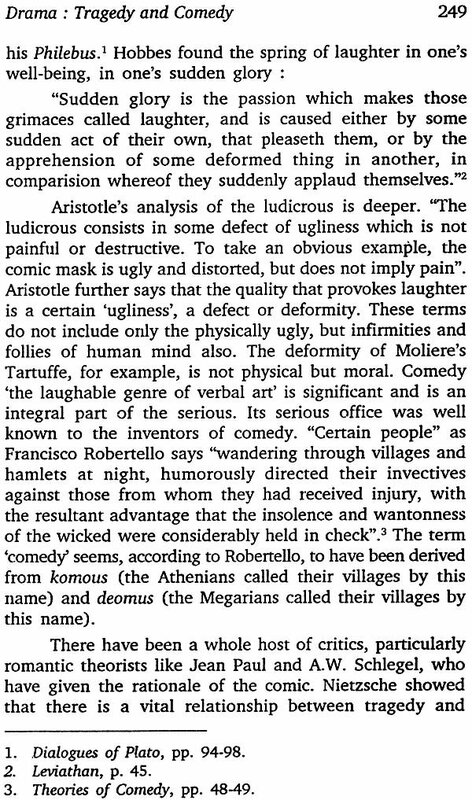 Although their books are primary comparative in intention, theft comments, perceptive and insightful in themselves, proved significant for the growth Comparative Aesthetics. Keith, particularly, has examined both the Indian and Greek theories of drama and has brought our relative strengths and weaknesses. It should be emphasised. However, that these authors did not have any overt intention to make a systematic comparison between the Eastern and Western theories of literature. A more deliberate and systematic comparison between the Eastern and Western theories of art was made Aaanda Coornaraswamy. His boot, The Transforn7ation Nature in Art, appeared in 1934. This may he considered he the real beginning of Comparative .Aesthetics as a For the first time the learned author 'presented statement of Oriental aesthetic theory based mainly on Indian and partly on Chinese sources; at tLs.uui Time, by means of notes and occasional, remarks, a basis is offered for a general theory of art coordinating Eastern and Western points of view'. In spite of certain self-imposed limitations he has succeeded in his attempt to a remarkable degree. He limited himself chiefly to a discussion of Christian and Scholastic theories of art and excluded from the scope of his study the post-Renaissance and what he calls the 'personal' theories of art. 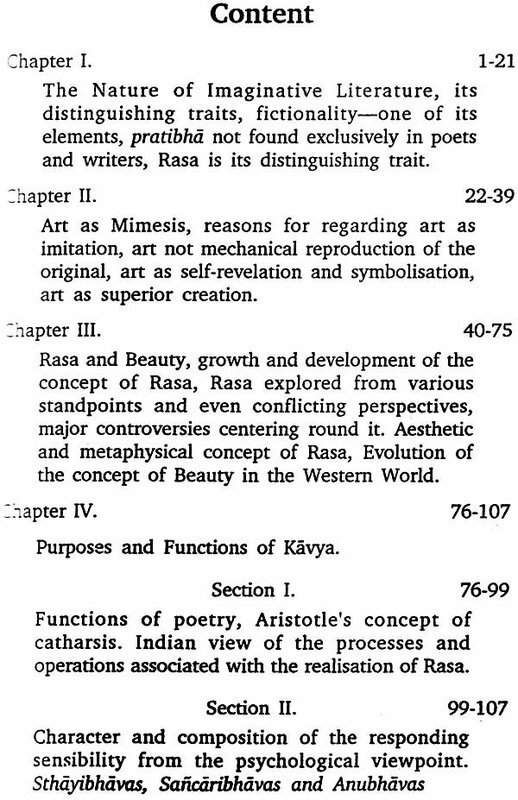 Since Coomaraswamy, quite a few aestheticians have written scholarly articles and explored specific areas of Oriental theories of art and have sought to establish parallels to Western theories. These articles have mostly appeared in the Journal of Aesthetics and Art Criticism. Notable among these contributions are P.J. Chaudhary's articles entitled 'Psychical Distance in Indian Aesthetics (1948)', 'The Theory of Rasa (1952)' and 'Catharsis in the Light of Indian Aesthetics (1956)'. Although idealistic in his point of view like Coomaraswamy, he introduces a psychological dimension to his study. Other notable contributions to this field of study are the articles by Van Meter Amis entitled 'Aesthetic Values in the East and West' which appeared in the J.A..A.C. in 1960 and 'Comparative Aesthetics' by Archi J. Bahm published in the same journal in the year 1965. A commendable attempt in Comparative Aesthetics, not yet completed in its total design, is Dr. K.C. 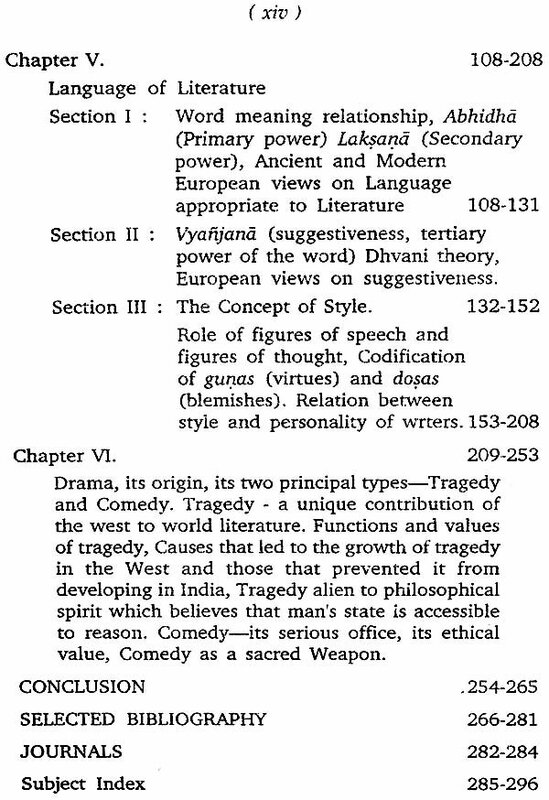 Pandey's Indian Aesthetics published in 1950 and Western Aesthetics in 1959. 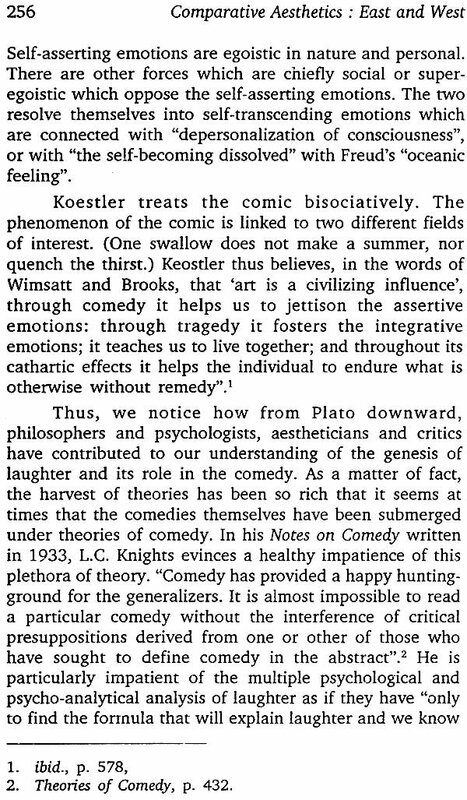 A random but perceptive appreciation of the Indian theory of dramatic illusion comes from Susanne K. Langer. In her book Feeling and Form (see Chapter VII, The Dramatic Illusion) she maintains that 'some of the Hindu critics, although they subordinate and duplicate dramatic art in favour of the literary element it involves. Understand much better than their Western colleagues the various aspects of emotion in theatre which our writers so banefully confuse: the feelings expressed by the actor, those experienced by the spectators, those presented as undergone by the characters in play and finally the feeling that shines through the play itself—the vital feeling of the piece'. Thomas Munroe had apparently been inspired by Coomaraswamy when he first applied himself to a systematic study of Indian Aesthetics. The fruits of his sustained researches into Comparative Aesthetics are contained in his book Oriental Aesthetics published in 1965. An added impetus to this East-West dialogue came after the liberation of the Asian countries from colonial rule when exchange of views among scholars of the East and West in the Oriental Conferences and Seminars became more frequent. Scholars from the West came to realise more and more the importance of Oriental theories of art. Consequent upon this, a growing need for translation of Sanskrit classics of Aesthetics was urgently felt by scholars working in this field. In response to this need, translation of Sanskrit classics of Aesthetics appeared in the West. R. Gnoli's book The Aesthetic Experience according to Abhinavagupta which appeared in 1956 deserves special mention. 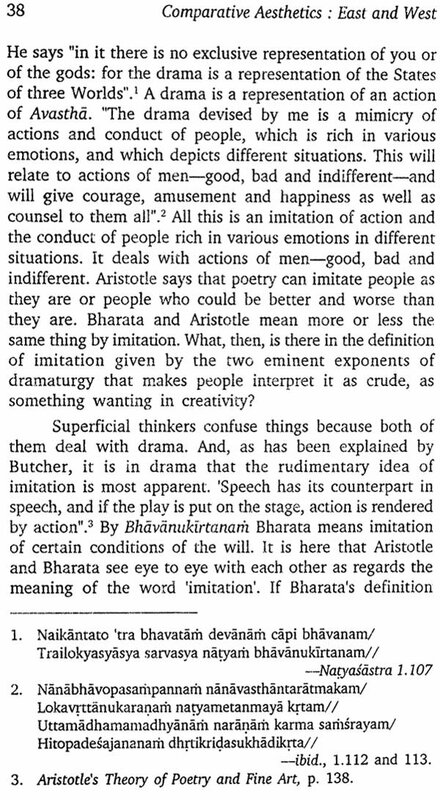 The translation of Bharata's Natya Sastra into English by Manmohan Ghosh was also intended to introduce this major work on dramaturgy to Western scholars. 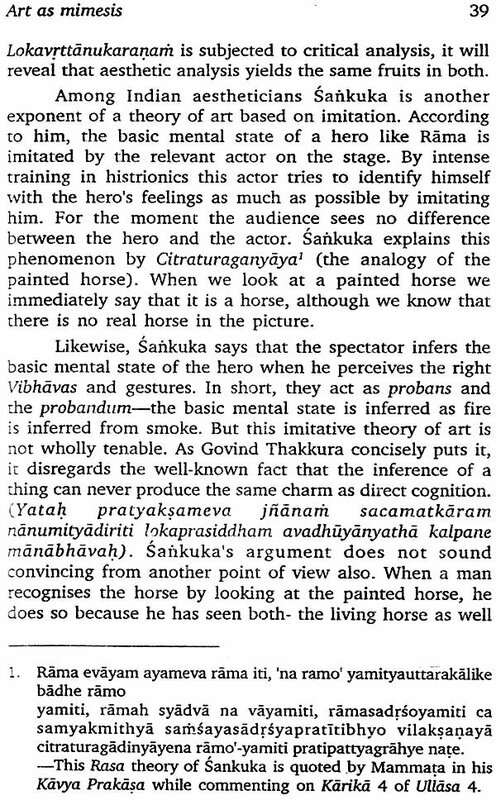 K. Krishnamoorthy's translation of Anandavardhana's llhvanyaloka which appeared in 1955 served the same purpose. This series of translations, while satisfying the urge of Western scholars to get more fully and intimately acquainted with Indian theories of art, excited them so much that they brought the perspective of comparison to bear upon them. This period of translation, of mutual exchange of ideas in Conferences and Symposia, has proved immensely productive for the growing discipline of Comparative Aesthetics. As Thomas Munroe has rightly observed, " (it is) becoming harder to maintain the traditional isolationism of Aesthetics". It is highly desirable that a general history of Aesthetics in this process of being established in one part of the world should take into account ideas originating and growing in another part so that a comprehensive theory of art may be propounded. The study which I have undertaken in the following pages is an humble contribution to that end. This study in Comparative Aesthetics is concerned with some important issues arising from our understanding of different approaches to Imaginative literature. 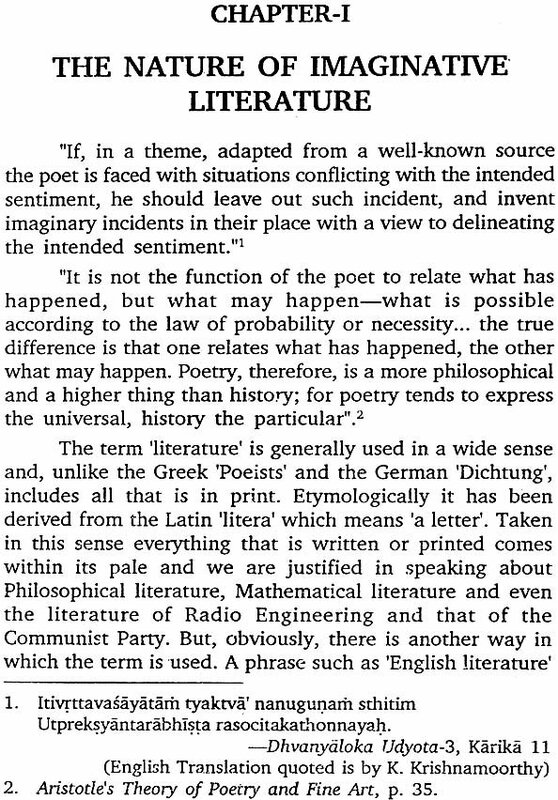 The issues that have engaged my attention are: the nature of Imaginative Literature: art as imitation or creation; the nature of Rasa and Beauty : the language of literature the purposes and functions of Kavya and nature of drama with its two branches, viz, tragedy and comedy , as a literary genre.